Muskrats are large rodents that live near lakes, slow-moving rivers, marshes, and ponds. They have small eyes, rounded ears, and brown fur. They use their long tails and webbed hind feet to swim, and their short front feet for burrowing and digging up plants. Muskrats have large front teeth for chewing through food like water lilies, cattails, and ferns. Muskrats will grow up to two feet in length from nose to tail. Muskrats often burrow into the sides of steep embankments. They'll conceal their den entrances beneath the surface of the water. If no suitable riverbanks are available, muskrats build dome-shaped lodges similar to beaver lodges. Because of they live their entire lives by the water, most people won't ever need to worry about muskrats. 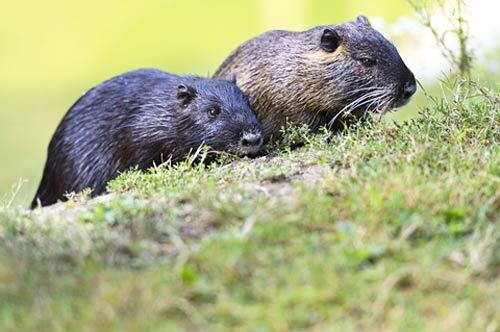 You'll encounter muskrats in places like farms, docks, or marinas, where steep banks holding irrigation systems, docks, and boathouses make enticing sites for the burrowing rodents. When muskrat overpopulate an area, an event known as an "eat-out" can occur. The large population eats up aquatic vegetation in an unsustainable and damaging way. This forces the rodents to move elsewhere in search of new food, but it can take decades for the ecosystem to recover. To get rid of a muskrat presence around your home, please call us at 716-208-5110. We will quickly and humanely locate and remove the muskrat, and we will work to repair any damage the muskrat caused.